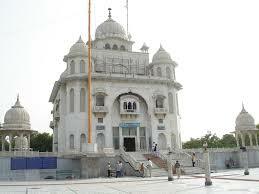 Here is Some Information about Gurudwara Damdama Sahib in New Delhi Delhi India. Nearest Metro station : Jangpura metro station. 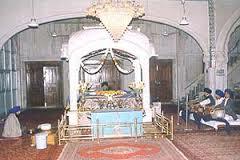 Gurudwara Damda ma Sahib is located at near Hazrat Nizamuddins dargah New Delhi. 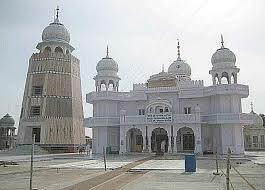 This gurudwara, like all the other gurudwaras also has a history and an association with one of the ten Sikh gurus. It is associated with the tenth Satguru, Guru Gobind Singh. 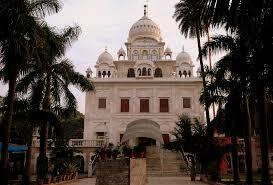 Gurdwara Damdama Sahib was built by Sardar Bhagel Singh in 1783, and later renovated by Maharaja Ranjit Singh. The location of the gurudwara signifies an important association with the Mughal Empire.It was originally built by Sardar Bhagel Singh in the year of 1783 which was then renovated & expanded by Maharaja Ranjit Singh. Presently, it is a sprawling complex containing buildings & facilities for priests, pilgrims & other administrative workers. The gurudwara is a witness to many important Sikh events. 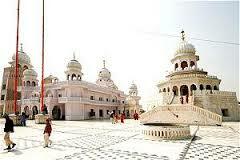 It sprawls over a large area of land with an accommodation for the workers and other members of the gurudwara. 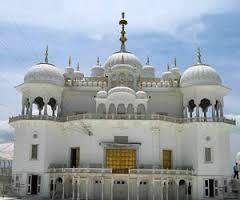 The gurudwara is built in a large complex with well maintained green gardens surrounding it. The lush green gardens make it all the more attractive for the devotees to spend time in the serene environment.The gurudwara and thye complex are entirely made up of white marbel, as is the custom of all Sikh worship places. There is an important festival that is celebrated with fervour at this gurudwara-Hola Mohalla. This festival takes place during the months of February and March. During this time of the year, many pilgrims visit this gurudwara to enjoy the celebrations of this festival and participate in the same with enthusiasm.The worshippers have to remove their shoes before entering the sanctum. At the entrance, the devotees are required to wash their hands and feet and cover their heads which signifies the purity of the body and reverence to the Guru Granth Sahib. According to history Shri guru govind sinh ji had meeting with Empror Bahadur Shah. guru sahib came to delhi in 1707 after Badshah Bahadur Shah captured the delhi throne. In preliminary meeting guru sahib gave in details the name of all those army personal and Kings of hilly areas who were responsible for inflicting terror & lynching on innocent sikhs and tender aged Sahibzaadas. They got Shri Anandpur Sahib Vacated and destroyed valueless belongings literary treasures of guru sahib. Listening to these atrocities Empror promised to punish all those responsible for such acts once he consolidates his power. After his royal army and Sikh volunteers demonstrated their martial art and then decided to have a fight between martial elephants. Everyone was astonished to see that male buffalo chased away martial elephant from fighting ring. Empror was very impressed and he was convinced of martial training of imparted by guru sahib. By Road : There are many public and private vehecals available to reach Gurudwara Damdama Sahib in New Delhi .people can also take buses, taxis or auto rickshaws from any part of the Delhi to reach the Gurudwara Damdama Sahib. By Metro : The Nearest Metro station is Jangpura metro station. By Rail : The Nearest Railway station is Hazrat Nizamuddins station.